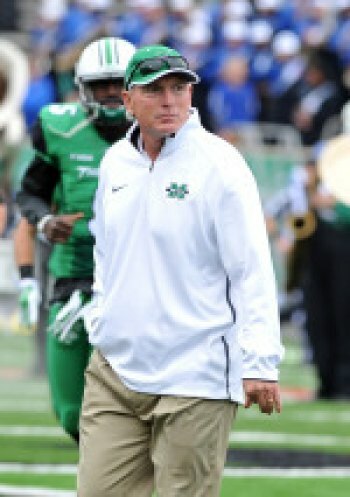 HUNTINGTON, W.Va. - Marshall coach Doc Holliday has announced the Thundering Herd's 2016 football recruiting class. The group features 24 student-athletes and includes three who are already enrolled at Marshall. For the first time in its history, Marshall has four of its signees ranked as four-star prospects and 11 more as three-stars by ESPN.com, Rivals.com, 247Sports.com or Scout.com – or some combination of the four. The class is regarded, as usual, as one of the best among the Group of Five. Committed on February 1 … played defensive tackle and offensive line at Oakland Mills earning all-state and all-county honors … also played baseball and basketball where he has averaged 5.1 points and 6.2 rebounds … had 11 sacks as a junior … rated a two-star prospect by Rivals.com and Scout.com. Committed on June 29 … also had offers from Air Force, Appalachian State, Army, Charlotte, Cincinnati, Furman, Georgia Southern, Georgia State, Jacksonville State, Liberty, Louisiana Monroe, Middle Tennessee State, Navy, Ohio, Southern Mississippi, Troy, Tulane, and Western Carolina … helped Lowndes rush for 156.5 yards, pass for 156.6 yards and score 31.9 points per game en route to a 6-5 record and the first round of the Class 6A state playoffs … bench presses 315 pounds and squats 525 pounds … rated a two-star prospect by Rivals.com, 247Sports.com and Scout.com. Committed on May 22 … also had an offer from Army and FIU … helped Newsome (5-5) pass for 924 yards and three touchdowns and run for 2,689 yards and 31 touchdowns … bench presses 290 pounds and squats 500 pounds … selected to play in the USA U18 International Bowl … named first-team All-Hillsborough County by the Tampa Tribune … rated a three-star prospect by Scout.com. Committed on Sept. 21 … also had offers from Alcorn State, Bethune-Cookman, Florida A&M, Idaho, Massachusetts, Southern Illinois, and Western Kentucky … was a Class 8A All-State third-team selection on defense … rated a three-star prospect by ESPN.com and 247Sports.com. Committed on July 9 ... also had an offer from Cincinnati, Kentucky, Louisville, Pittsburgh, Bowling Green, Ball State and Toledo … had 47 tackles and one sack for Winton Woods (5-5) as a junior … Had 35 tackles, including 13 tackles for loss and eight sacks as a senior … rated a three-star prospect by 247Sports.com. Committed on February 1 … also had offers from Georgia, Minnesota, Ole Miss, Tennessee, Middle Tennessee and Georgia State … rated the 38th-best running back nationally by Scout.com … runs the 40 in 4.6 seconds … broke Clarke Central’s single-game rushing touchdown record as a sophomore, scoring five times…also returned kicks and played safety at Clarke Central … also played basketball … had 10 rushing touchdowns as a junior with 736 rushing yards … rated a four-star prospect by ESPN.com. Committed on February 2 … also had offers from Cincinnati … Averaged 15.9 yards per catch with 64 catches for 1,016 yards and 12 touchdown receptions … Helped Booker T. Washington win four consecutive 4A state championships … rated a two-star prospect by Rivals.com and Scout.com. Runs the 40 in 4.53 seconds … Had offers from numerous schools, including Alabama, Auburn, Baylor, Clemson, Florida, Florida State, Iowa State, Kentucky, Miami (FL), Mississippi State, Notre Dame, Ohio State, Penn State, Tennessee, Texas, Virginia Tech and Wisconsin … Widely regarded as one of the top dual-threat quarterbacks in the nation … Threw for 1,290 yards with 12 TDs as a junior with 665 rushing yards and seven more scores … Rated a four-star prospect by ESPN.com and Scout.com. Already enrolled at Marshall … also had offers from Appalachian State, Florida A&M, Kent State and Troy … runs the 40-yard dash in 4.47 seconds … has a 31-inch vertical … bench presses 180 pounds and squats 350 pounds … won the state title in track in the 110 meter hurdles … also played wide receiver in high school … rated a two-star prospect by ESPN.com, Rivals.com, 247Sports.com and Scout.com. Also had offers from Arizona, Miami (FL), Ole Miss, North Carolina, South Florida, Tennessee, Western Kentucky and Kent State … Also returned kicks for South Fort Myers … clocked at 4.31 in the 40 last summer … Has 95 career catches for 1,560 yards and 14 touchdowns … Averaged 13.8 yards per carry on the ground with two touchdowns as a senior … rated a four-star prospect by ESPN.com. Committed on Oct. 9 … Originally committed to Western Kentucky … also offered by South Florida … ran 144 times for 1,607 yards and 20 touchdowns to lead Fort Meade (9-2) to the first round of the Class 1A state playoffs … rated a two-star prospect by Rivals.com, 247Sports.com and Scout.com. Already enrolled at Marshall … also had offers from Appalachian State, Army, Buffalo, Charlotte, Ohio, Purdue and Toledo … rated a three-star prospect by ESPN.com, 247Sports.com and Scout.com. Committed on May 26 … also had offers from Rutgers, South Alabama, UTSA, Virginia and Wake Forest … runs the 40-yard dash in 4.5 seconds … bench presses 225 pounds and squats 315 pounds … rated a two-star prospect by Rivals.com, 247Sports.com and Scout.com. Committed on June 27 … Received interest from Indiana, Northwestern, Wake Forest and West Virginia … Rivals ranks him the No. 4 overall prospect in the Mountain State … ran for 2,332 yards and 42 touchdowns on 178 carries and had 213 yards and four scores on 15 catches to lead Point Pleasant (12-1) to the Class AAA semifinals … also passed for two touchdowns and returned five punts for scores … also made 95 tackles … his brother, Derek, played at Marshall and his father, Darrell, played at West Virginia … runs the 40-yard dash in 4.73 seconds … bench presses 370 pounds and squats 600 pounds … rated a three-star prospect by ESPN.com, 247Sports.com and Scout.com. Committed on June 26 … had offers from Appalachian State, Arkansas State, Ball State, Bucknell, Buffalo, Charlotte, Coastal Carolina, Elon, Florida Atlantic, Fordham, Furman, Gardner-Webb, Georgia Southern, Georgia State, Jacksonville State, James Madison, Liberty, Louisiana Monroe, Middle Tennessee State, Presbyterian, Robert Morris, San Diego State, Toledo, Troy, Tulane, Western Kentucky and William & Mary … helped North Gwinnett (8-3) throw for 3,425 yards and 39 touchdowns and run for 1,368 yards and 17 scores en route to the first round of the Class 6A state playoffs … runs the 40-yard dash in 4.9 seconds … bench presses 385 pounds and squats 485 pounds … rated a two-star prospect by Rivals.com, 247Sports.com and Scout.com. Committed on June 12 … also had offers from Florida Atlantic, Georgia State, Middle Tennessee State, Southern Mississippi and Troy … named first-team all-region as a junior … led Lee County to a 6-1 start before breaking his fibula and missing the final three games … rated a three-star prospect by 247Sports.com and Scout.com. Committed on June 26 … also had offers from Buffalo, Charleston Southern, Charlotte, Purdue and Toledo … had 42 tackles, 19 pass breakups, four interceptions, four fumble recoveries and three forced fumbles to lead Hilton Head (11-3) to the second round of the Class AAA state playoffs … also returned five kickoffs and one punt for touchdowns … runs the 40-yard dash in 4.31 seconds … rated a three-star prospect by 247Sports.com and Scout.com. Already enrolled at Marshall … also had offers from Iowa State and West Virginia … had 40 tackles, eight pass breakups and two interceptions for East Mississippi (8-1) in 2015 … originally was a Class of 2014 prospect who signed with Virginia Tech … had offers from Boston College, Cincinnati, Connecticut, Georgia Tech, Maryland, Miami, Nebraska, North Carolina, North Carolina State, Ohio State, Oklahoma, Tennessee, Vanderbilt, Virginia, Wake Forest, West Virginia and Wisconsin as a highly ranked recruit from Thomas Dale High School in Virginia … rated a three-star prospect by Rivals.com, 247Sports.com and Scout.com … Rivals ranked him as the No. 26 safety in America and the No. 11 overall prospect in Virginia in the Class of 2014 … runs the 40-yard dash in 4.5 seconds. Committed on January 31 … previously committed to Southern Mississippi … also had offers from Arkansas State, Samford, South Alabama and Southern Mississippi … was a Class 5A All-State second team selection as an athlete … runs the 40-yard dash in 4.3 seconds … has a 35-inch vertical … bench presses 205 pounds and squats 305 pounds … rated a two-star prospect by Rivals.com, 247Sports.com and Scout.com. Committed on July 28 … also had offers from Alcorn State, Charleston Southern, Florida A&M, Fordham, Furman, Ohio, Samford, Stetson, Tulane and Western Kentucky … helped Braden River (13-1) throw for more than 1,500 yards and run for more than 2,000 yards en route to the Class 7A state semifinals … runs the 40-yard dash in 5.12 seconds … bench presses 325 pounds and squats 485 pounds…named first-team all-state … selected to play in Blue-Grey All-American game … rated a two-star prospect by Rivals.com and Scout.com. Committed on January 30 … previously committed to Michigan … also had offers from Arizona, Boston College, California, East Carolina, Hampton, Indiana, Iowa, Kentucky, Michigan, Michigan State, North Carolina State, Pittsburgh, Temple, Wake Forest, Washington State and Wisconsin … rated a three-star prospect by ESPN.com, Rivals.com, 247Sports.com and Scout.com … Rivals ranks him as the No. 22 overall prospect in Maryland … had 57 tackles and 16 pass breakups for Upper Marlboro (6-4) … gave up only eight receptions. Committed on January 31 … also had offers from Florida A&M, Iowa State, Middle Tennessee, South Carolina, Tulane, UCF, USF and Western Kentucky … had 31 catches for 952 yards and five touchdowns and 21 carries for 177 yards for Dixie M. Hollins … led all tight ends in the state of Florida in receiving yards in his first season of football … a two-sport athlete who also stars in basketball for Dixie M. Hollins … runs the 40-yard dash in 4.7 seconds … bench presses 220 pounds and squats 315 pounds … rated a three-star prospect by Rivals.com, 247Sports.com and Scout.com. Committed on Jan. 22 … Nationally-ranked as a member of the ESPN 300 … also had offers from Alabama, Clemson, East Carolina, Florida, Florida State, Hampton, Michigan, Michigan State, Mississippi, Morgan State, North Carolina, North Carolina State, Notre Dame, Old Dominion, Temple, Vanderbilt, Virginia, Virginia Tech and Wisconsin … … rated a four-star prospect by ESPN.com, Rivals.com, 247Sports.com and Scout.com … Rivals ranked him as the No. 183 overall prospect and No. 8 inside linebacker in America and the No. 4 overall prospect in Virginia … had 115 tackles, 12 forced fumbles and 10 sacks to lead Indian River (11-3) to the Class 5A state semifinals … runs the 40-yard dash in 4.7 seconds. ?